Lots of businesses are turning to Tumblr blogs as a way to do some marketing. Tumblr is great for businesses that are mainly visual, as most of Tumblr is pictures and GIFs. This social networking platform is also full of teenagers and college students. If you are trying to appeal to a younger audience, check out Tumblr. 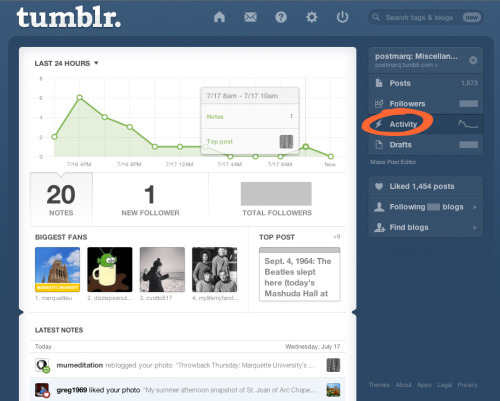 Tumblr is another social media platform with built-in analytics, like Pinterest and Facebook. There are other outside tools that will give you analytics, such as Simply Measured (which we talked about with Instagram analytics) and Numblr. However, the easiest and least expensive (some of these analytics tools charge you) way to figure out Tumblr engagement is to use the “Activity” section pictured below. “Activities” is great because it will tell you exactly who has liked or reblogged your content, and who is following you. Other analytics don’t give you this specific information – they just tell you how many people have reblogged you. This can be helpful for a lot of reasons: you can see if your audience has expanded, rather than just the same people over and over responding to your content. You can get to know your audience a little better and cater to them, if you’d like. You can return the favor by liking, reblogging, or following them, in turn building up a social media community. Unfortunately, Tumblr analytics still lacks a lot of what other social media platform analytics has. You can see the time when your content is being liked or reblogged, which can give you an idea of when your followers are online, but does not tell you outright like Facebook does. Your most popular posts are displayed, but you are unable to see how all of your posts compare to one another. At one point in the past, Tumblr had a feature called “Tumblarity.” This was similar to the current “Activities,” except it would tell you how you ranked up compared to other Tumblr blogs. It would also show you who the top Tumblr blogs were, allowing you to glean some inspiration from them. It gave a fuller picture, such as the types of content you were posting, how much original content, and how much engagement you had ever received. It does give you a little more information in terms of your content type and originality. It’ll also tell you the most popular posts and how many notes you’ve gotten. 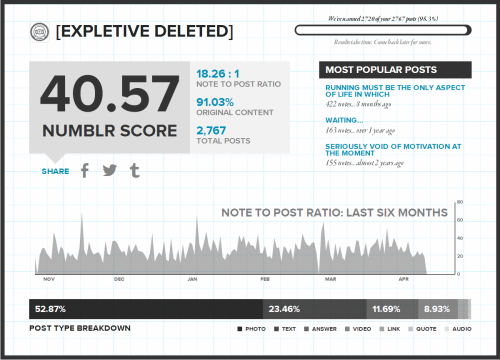 A Numblr score is made up of three weighted variables that end up placing a Tumblr account on a scale from 10-100. We capture every post a Tumblr has authored to calculate the score. For the purposes of this report, we rounded scores to the nearest whole number. The most influential variable is a Tumblr’s note to post ratio. We look at all of the posts that are originally authored by the Tumblr account and then calculate an average; reblogged posts don’t count toward the ratio. The second variable is content longevity. There’s some nuance to it, but what we’re doing is calculating the distance in time between when a post was first authored and when it received its last note. The longer that distance is, the better. The third variable is the post frequency of a Tumblr. We calculate the time between each post and average it out across the Tumblr’s entire history to calculate a post interval. You can probably guess that there’s a sweet spot here. Post too frequently and you’re more likely to underperform because you won’t get as many notes per post. Post too infrequently and you’ve got a stale presence that people don’t recognize in their Tumblr Dashboard. Finally, we look at the entire system’s performance (every account that’s been added to Numblr) and score an account relative to how well all of the other accounts are performing. So like Tumblarity, your Numblr score tells you where you ranked compared to other Tumblr blogs. That’s what I’ve got for today. Tell me how you feel about Tumblr, Tumblr analytics, and Numblr in the comments! This entry was posted in Analytics and tagged numblr, social media marketing, tumblr on August 19, 2013 by admin. Bloggers and businesses have been using Pinterest to promote their brand for a while, but only recently has Pinterest seemed to catch on to this fact and help the process. Pinterest‘s latest update has been to allow accounts specifically for businesses. This is great news for people who weren’t sure how to fill out the first and last name boxes with the name of their business. Also great because this included Pinterest analytics! Previously on this blog, we’ve discussed Facebook Analytics, Twitter Analytics, and even Instagram Analytics. And now we’re going to move on to Pinterest! In order to view your account’s analytics, you have to be a business account. This is kind of a bummer for anyone who’s “business” is promoting their own blog. I think, however, there are ways around this. You can say that your blog is your business, seeing how it does have its own website. If you already have a Pinterest account set up for your business before this update happened, you can convert your account to a business one. It’s annoying, but it works. You do have to verify your website, but there are lots of tutorials available about that. You can find some awesome Pinterest tips and tricks and tutorials here and here. Once you have your business account set up and your website verified, analytics should be available! Like it shows in this picture, “Analytics” is under your account’s drop down menu on the right. Under “Analytics” are the subheaders “Site Metrics,” “Most Recent,” “Most Repinned,” and “Most Clicked.” Like other social media analytics, this will give you insight into what your most popular posts are. With this information, you can easily see what topics your audience is interested in and what images appeal to your audience. 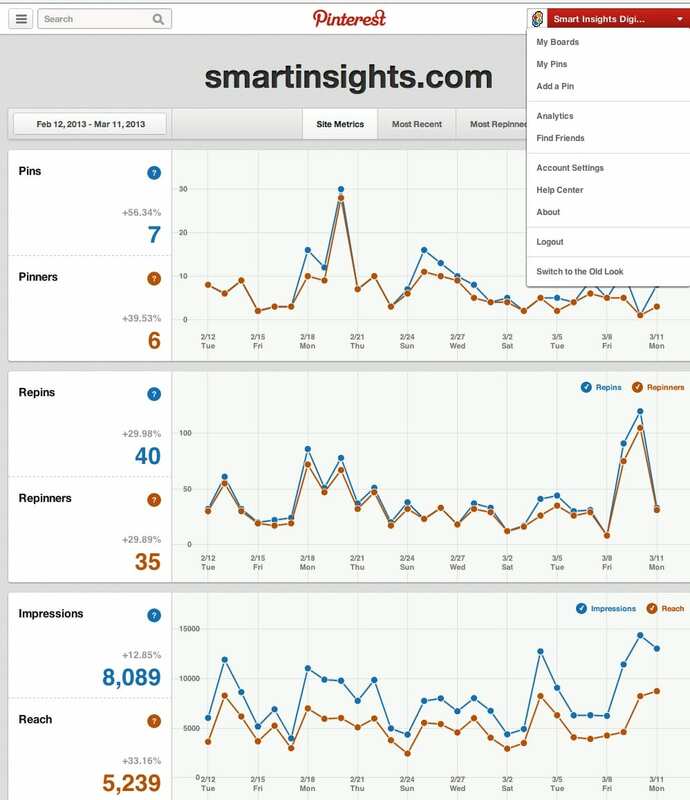 “Site Metrics” will also tell you when your audience is most active. Unfortunately, this data isn’t totally conclusive. As you can see from these charts, Pinterest will not tell you when your followers are online. You’ll only see when they repinned your pins. This data can be skewed by when you’ve pinned and other similar factors. It can absolutely give you a good idea – for instance, in the above picture, the most repins were done on the weekend. This would tell you that you should pin more on the weekend. In the section above that, you’ll see how many people pinned images directly from your website. This can help you determine your site’s functionality. If you aren’t getting a lot of direct pins but an oddly disproportionate amount of repins, then you know that your content is fine, but your website isn’t very Pinterest-friendly. Try to find ways to optimize your website for Pinterest, such as adding “Pin-it” buttons on your pictures. It’s also nice because you can see how many people saw your pin versus how many people clicked through to your website. This can tell you that you need to make your pins more alluring. Look up some methods that other successful pinners have used, especially one how to optimize individual pins. Have you used Pinterest analytics yet? What do you think of this new tool? Has it been helpful for your business? Let me know by commenting below! This entry was posted in Analytics on August 8, 2013 by admin. I guess this post comes a little late, since I already talked about guest posting techniques for your blog. I should have started out with this post. But oh well! Better late than never. One of the ways that SEO works is that your website will be more optimized with unique content. Having something new to post regularly will refresh your website and keep it relevant. It will also help you in terms of keywords. The more you write about topics relevant to your business, the more you will show up when those keywords are searched for on Google. It also has the added bonus of making you appear to be an expert in your field. If you share your blog posts on social media, you can drive more traffic to your home page, resulting in more exposure and more sales. So, what should you write about? Really, this depends on your business. If you have a local business, write about your area. Absolutely write about anything that pertains to your products. You can also write about businesses in general, like how to make your office greener or anything relating to being an employee. If you find something interesting and think your audience might too, go ahead and write about it. Writing about social media is also a great idea. Let’s create an example. We’ll make up a hypothetical beauty salon located in Denver, Colorado. If this beauty salon had a blog, they would want to write about Denver, Colorado; beauty products; being a freelance beautician; beauty school; beauty salons; different beauty treatments; keeping your body healthy; being an employee; advertising, especially on social media; celebrities and their beauty treatments; budgeting; and more. When it comes down to it, don’t limit yourself. You’ll do better to keep it relevant most of the time, but it’s more important to have fun with it and be creative. This entry was posted in SEO and tagged blog, business on August 2, 2013 by admin. Many businesses these days are venturing into Instagram to promote their brand. This is most useful for companies that target younger audiences, sell clothing or similar products, or sell photography services. Lots of popular musicians and bands are also using Instagram. Actually, tons of restaurants and retail merchants use it, too – they ask customers to check in at their location, take pictures, tag their company, etc. Instagram is a great, free piece of mobile marketing that’s really easy to use, so why hasn’t your company boarded this train yet? Once you’ve created an account and started posting, check out Instagram Analytics: http://simplymeasured.com/free-social-media-tools#report-170. (I linked back to this same site in my post about Twitter Analytics.) This website will generate an analytics report for you for free, but you do have to follow them on Twitter. Small price to pay, in my opinion. It honestly doesn’t tell you a lot that you don’t already know, seeing how you can look at the pictures you’ve posted on your Instagram account and see how many interactions they’ve generated. But it does help to have it all graphed out and compared side-by-side. It does tell you the most popular post, the most popular location that you’ve posted at, and the most popular filter effect you’ve used. If you share your Instagram posts on Facebook and Twitter, it can also give you information about your post on those platforms. The biggest difference between Facebook & Twitter Analytics and Instagram Analytics is that Facebook and Twitter can tell you how many people have seen your post, as well as interacted with it. When one person likes a picture or status on Facebook, or retweets a tweet on Twitter, it is shown on their profile where all of their friends can see it. Instagram does not have this option. Users can only see your posts if they are following you or if they are looking at the hashtag your picture happens to be listed under. Even then, those views are not tracked. Questions, comments, concerns, pictures? Share below! This entry was posted in Analytics and tagged analytics, instagram, social media, visual media on August 2, 2013 by admin.